Then you can expect the watch to run for next 12 hours if you wear it for 8 hour. In case of any problems after receiving the watch. After winding pull the key. This is watch is in good condition. Dial ands hands in very good condition. Watch is running and working good. This is watch is in good condition. Crystal in very good condition. Dial ands hands in very good condition. Watch is running and working good. Then you can expect the watch to run for next 12 hours if you wear it for 8 hour. In case of any problems after receiving the watch. Watch Citizen. - water resistance: 10 ATM. - clasp type: buckle. - band colour: black. - band material: rubber. ABOUT THIS CITIZEN MOONDATER FOR SALE. It is known as the manufacturer of Cincom precision lathe machine tools and Citizen watches. It is one of the world's largest producers of watches. CITIZEN OVERVIEW. 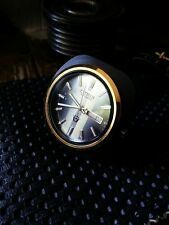 1970s Orologio automatico CITIZEN 17 gioiello movimento GOLD PLATED JAPAN fwo EX COND! Case: Polished gold plated stainless steel. 18mm lug size. SEE PHOTOS WOULD BE HARD TO FIND A BETTER ONE IMHO. SEE PHOTOS. I HAVE DYSLEXIA SO IT NOT THAT EASY. I TRY MY BEST AND TAKE GOOD PHOTOS TO HELP YOU OUT. Orologio automatico Citizen Micky Mouse. NUOVO cinturino in pelle. Micky Mouse. Citizen Automatic Watch. New leather strap. Citizen Orologio... Manuale Automatico... 70s. SUPER VINTAGE AUTOMATIC 21 gioiello CITIZEN Orologio da polso. di SERIE 102565. ha bisogno di lavoro. Functions beautifully while being worn and exercised, but runs out of power after a few hours of inactivity. Everything is clean and crisp;. Be sure to initially wind the watch as much as possible before wearing because it will have been idle for a while before you receive it. Automatic watches are wound by swinging backwards and forwards for a couple of minutes prior to wearing. Caliber 8200A. For sale Citizen 21 j. automatic. on the 12 pictures. conditions can bee see. Check from the list,pls -Wallis&Futuna. -United Arab Emirates. -Sri Lanka. The watch is in perfect working order. It has a full Luminous Arabic dial with Luminous Hands. THE ORIGINAL STICKERS ARE STILL ON THE BACK. It is a self winding watch so does not require a battery the strap is full size new leather strap . (ANALOGUE WATCH CARRIES A FULL. 5) WEAR THE WATCH AS AUTOMATIC WATCH. 1) SHAKE THE WATCH IN A CIRCULAR. 6) THE WATCH SHOULD RUN FOR A. THE WATCH IS WORN FOR 8 HOURS. 4)PUSH CROWN /BUTTON BACK INTO PLACE. GRATIS P + P; Vintage Unisex Orologio Data Automatico CITIZEN. NUOVO Strap. GRANDE affare. WATER RESISTANT. AND MOST ARE BOXED/CASED. COMPETITIVELY PRICED. ALL WATCHES ARE. LOOK NO FURTHER. WONDERFUL PRESENT. WOULD ALSO MAKE A. (ANALOGUE WATCH CARRIES A FULL. 1)SHAKE THE WATCH IN A CIRCULAR. THEN THE AUTOMATIC WATCH. 6)IF WATCH IS WORN FOR 8 HOURS. 4)PUSH CROWN /BUTTON BACK INTO PLACE. MINIMUM OF AT LEAST 12 HOURS. (CLOCKWISE). (ANALOGUE WATCH CARRIES A FULL. 6)IF YOU WEAR THE WATCH FOR 8 HOURS THE WATCH SHOULD RUN FOR AT. 1)SHAKE THE WATCH IN A CIRCULAR. 4)PUSH CROWN /BUTTON BACK INTO PLACE. LEAST A MINIMUM OF 12 HOURS. (CLOCKWISE). (ANALOGUE WATCH CARRIES A FULL. 5)WEAR THE WATCH AS AUTOMATIC WATCH. 1)SHAKE THE WATCH IN A CIRCULAR. THE WATCH SHOULD RUN FOR AT. 6)IF YOU WEAR THE WATCH FOR 8 HOURS. 4)PUSH CROWN /BUTTON BACK INTO PLACE. (ANALOGUE WATCH CARRIES A FULL. 5)WEAR THE WATCH AS AUTOMATIC WATCH. 1)SHAKE THE WATCH IN A CIRCULAR. 6)THE WATCH SHOULD RUN FOR. 4)PUSH CROWN /BUTTON BACK INTO PLACE. HOURS IF WORN FOR 8 HOURS. A MINIMUM OF AT LEAST 12.